All cosmetic store items will be non-tradeable. Ashes of Creation pre-order packs. Pre-order packs are available from the Cosmetic store. 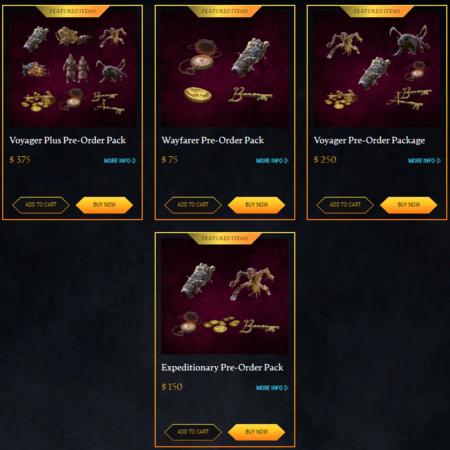 Voyager plus pre-order pack (History). 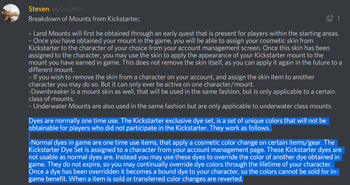 Dyes are a cosmetic item in Ashes of Creation. 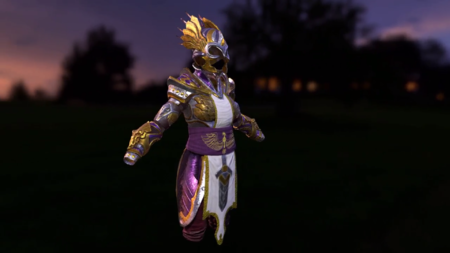 Dyes can be used to customize armor color. ↑ 1.0 1.1 1.2 Ashes of Creation cosmetic store. ↑ 7.0 7.1 Interview, 11 May 2018 (32:36). ↑ 8.0 8.1 8.2 Livestream, 8 April 2018 (PM) (58:29). ↑ 12.0 12.1 12.2 Livestream, 28 July 2017 (9:47). ↑ 20.0 20.1 20.2 Livestream, 26 May 2017 (19:51). ↑ 21.0 21.1 Reddit Q&A, 8 January 2019. ↑ 27.0 27.1 Interview, 20 October 2018 (3:34:46).